Colin Stuart was born on July 8, 1982 in Rochester, Minnesota. Stuie comes from a family of hockey playing brothers who all played for Colorado College. Older brother Mike was drafted by the Nashville Predators in the 5th round, 137th overall in 2000. 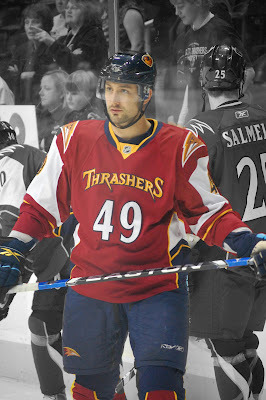 Mike currently plays for the Graz 99ers of the Austrian Hockey League. Younger brother Mark was drafted by the Boston Bruins 21st overall in the first round of the 2003. Mark had a nice little run for the cup this season with Boston. Most people know about Stuie's brothers, but many don't know he has a hockey playing sister, too. Cristin Stuart has been quite the defensive player at Boston College. The Stuart brothers swear that their sister is the best player of all of them. 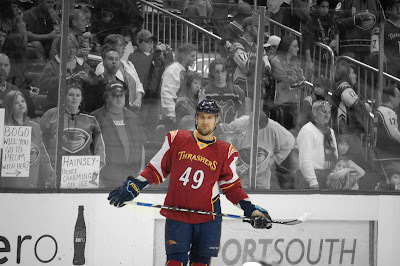 Stuart was drafted by the Atlanta Thrashers in the 5th round with the 135th pick in the 2001. Colin scored 77 points (38 goals, 39 assists) and 154 penalty minutes in 156 games over four-year career at Colorado College from 2000-04. 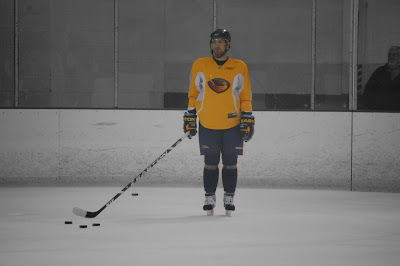 Stuie joined the Atlanta Thrashers in 2004 and was assigned to the Chicago Wolves. 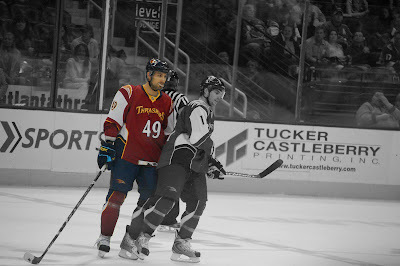 Stuie also played 11 games for the ECHL's Gwinette Gladiators. 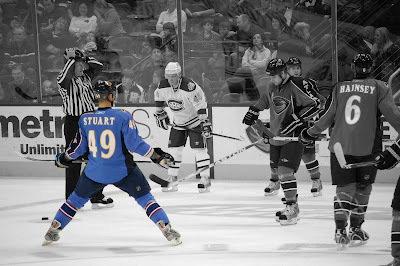 Stuie made his NHL debut during the 2007-08 season, playing 18 games and scoring 3 goals. Colin returned to Chicago in 2008 and helped the Wolves win the Calder Cup. 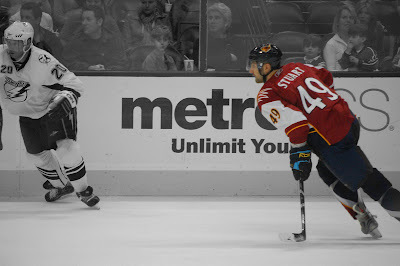 Stuart started the 2008-09 season with the Chicago Wolves, but was called up to Atlanta at the end of January and played for the remainder of the season. 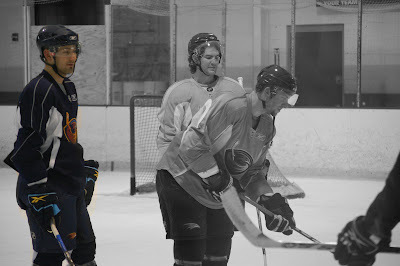 For this season Stuie played in 33 games for the Thrashers. He had 5 goals and 3 assists for 8 points. Most impressive (to me) is that THREE of his five goals were shorthanded. Nice! We were also super proud of our Stuie when he represented the USA in the World Championships this year. We didn't win a medal, but we finally beat the Finns! Thank you Stuie! 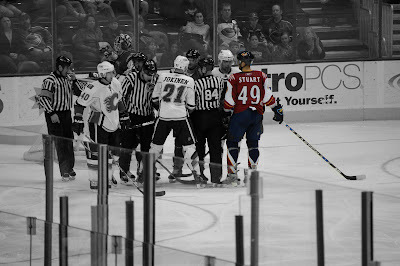 This is my favorite picture of Stuie from the season. It's from the "Shirts Off Of Our Backs" night at the final game. He just looks so nice and friendly. 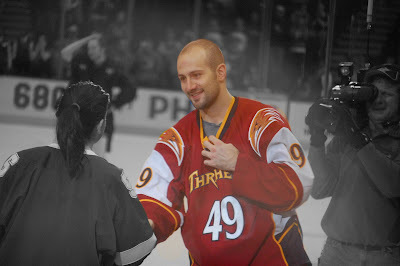 One of my favorite memories of Stuie of the season is of him and some other Thrashers playing Goal or Roll with Moose. 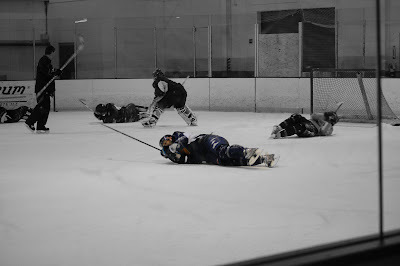 Everyone shot the puck and if they didn't make a certain number of goals, they had to roll. If Moose didn't make a certain amount of saves, he had to roll. Moose was quite good! Great photo manulation! I love it! I'm a 39 year old rabid hockey fan in Atlanta. I'm originally from Mobile. 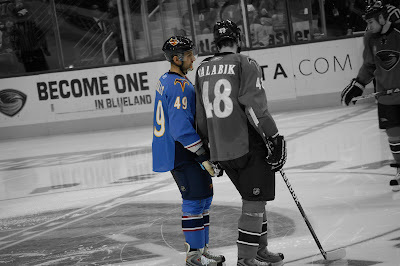 I've been devastated by the loss of my Thrashers, but I'm trying to keep this blog going. 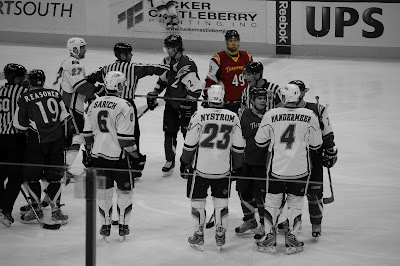 I love to take pictures at hockey games. 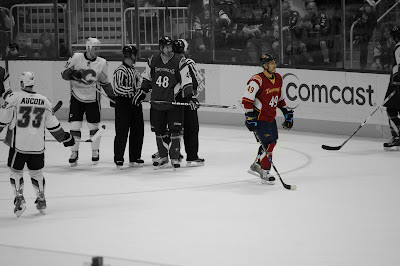 If you like crappy pictures, puckbunny comments and dumb jokes...you'll love my blog. Cam Ward, I freaking hate you.